Watch Your HAPPY Neighbors – click on any video and see who you recognize! The highly anticipated I AM ROC HAPPY videos were moved from our previous provider to YouTube as of April 2016! Feel free to click any video and share with your friends! Our official hashtag promotes our love for the city of Rochester, New York. Sponsored by Setting The Tone, "Dictator" Tone Williams and an entire camera crew filmed hundreds of Rochester natives and residents, laughing, dancing and smiling to celebrity artist Pharrell Williams’ award-winning single, “Happy.” All videos were filmed and produced locally using CROCK A/V STUDIO. Additional production assistance was provided by 12 Parks Productions. Your smallest contributions make a world of difference to your loved ones and to complete strangers. Let's rise up Rochester and be ROC Happy for a better community. This year, Setting The Tone sponsored a CITYWIDE music video promoting happiness and positivity in the city of Rochester! Residents had a chance to strut, dance, flip, etc. to “Happy”, a song written and produced by Pharrell Williams (www.24hoursofhappy.com). People performed all over the city and many just came to simply watch! Happy App & Upload has been discontinued. 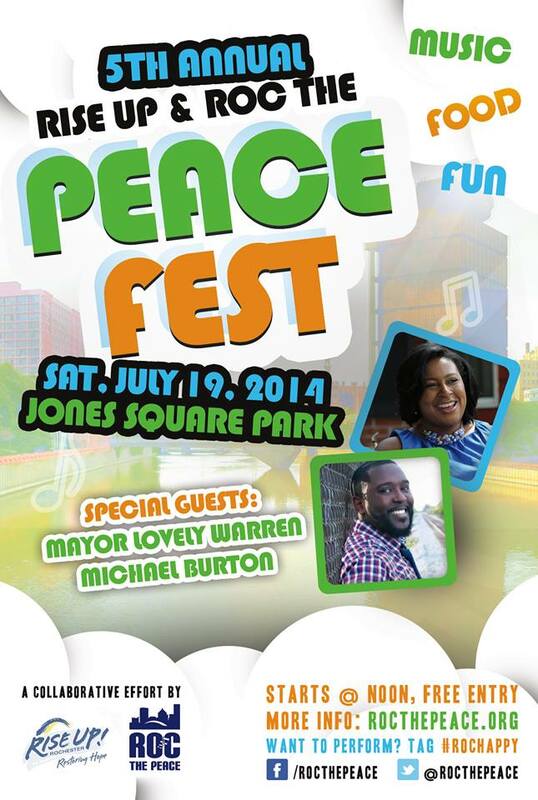 ROC the Peace (www.rocthepeace.org) and Rise Up Rochester will be hosting the 5th Annual ROC the Peace Fest 2014 this July. As a sponsor of Roc The Peace, Setting The Tone wants to show the world our beautiful city. We are using a host of sponsors and volunteers to pull off this operation. If you are interested in volunteering for Roc The Peace, please visit rocthepeace.org. Do you want to upload your video? We want you to demonstrate your love for our beloved city! To upload a video, please complete our talent application and we will provide you the means to upload it. Open Happy App & Upload!